Having so much visitors is awesome, the only problem is how to bring in new followers, and keep the regular ones coming back for more. Great deal of you follow this website through some sort of widget, or even more often – through your own RSS reader. This gives you an advantage: you instantly see that the new optical illusion has been posted, and you rush to the site to see it’s explanation, perhaps see more illusions attached inside the post, and possibly leave a comment. Well, the problem occurs on my end. You see the newest illusion, click few of the related underlined links, and then you leave. Then I have to figure out which new optical illusion to post in less than 24 hours, not to loose my steady traffic. This ofcourse isn’t any of your concern, but leaves me tense about continuously finding new content, and asking my self will you like it or not. Well, this is how it goes, and probably won’t change a bit. If you wish to help, you can continue stumbling our content, or email me if you’d like to help me with some guest articles. 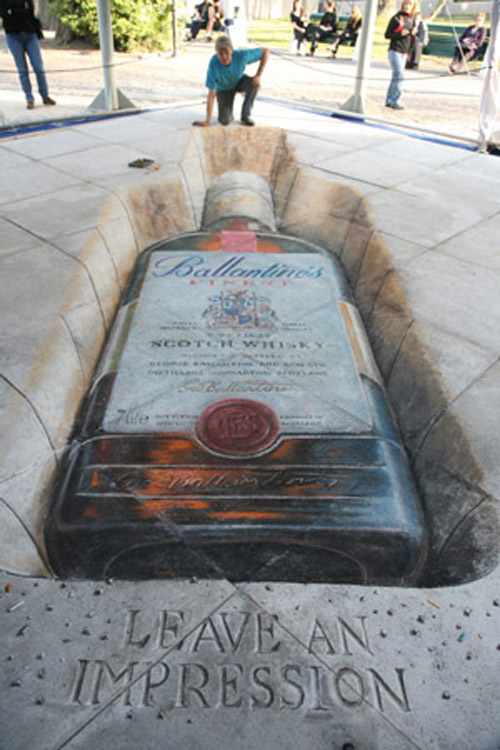 In the mean time, enjoy this new 3d chalk drawing collection by Julian Beever. If you thought we forgot all about him, you were deeply mistaken. Instead of only seeing new illusions through a widget, I advise you to visit the homepage here and then. There just might be some examples you possibly missed! Imagine someone who’s intoxicated stumbling across that first one and trying to get at the goodies inside. These are so brilliant. One of these days I’d like to see one up close and personal. Thank you. Very Nice! I agree with CareBear… I’d LIke to see one in real life. All of these are amazing! Way to go! 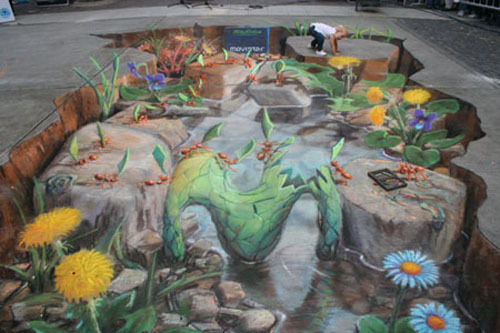 Cool!When I saw the pictures,I thought they were real! why is the bottle so big and why have they dug up a hole to put it in. 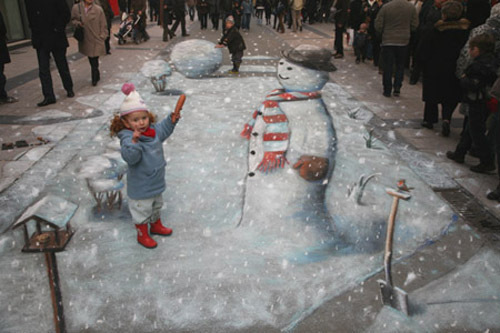 i dont get this illusion, just some bottle, a hobo, and a girl playing in the snow,why is there snow, oh wait are they from chalk oh right oops, my backspace buton dont work. woow! this one was really, really nice! These are SO cool!! I hope I can see at least one some day. Could you please have your iGoogle plugin open in a new window like most others do. 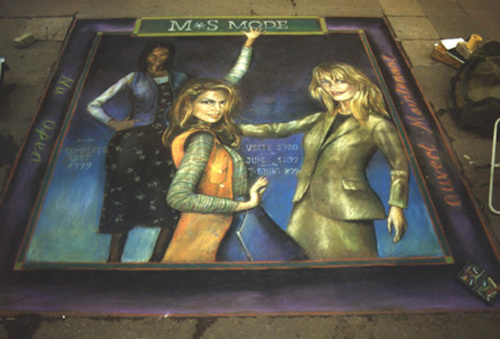 I love these, but I would like to see all of them from the two different angles, so as to see the effect and how it had to be chalked to achieve the effect. 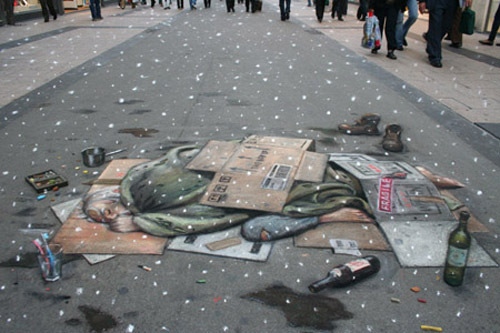 The first one and the homeless person one are really good!! SO GOOD. that’s a great talent. B.t.w. When I made my personalized google homepage, mighty optical illusions was automatically one of the items! These are all so amazing. Brilliant work. I’d like to see them in real life, and at different angles to see how precise you have to be with the camera to get the right effect. Thanks! Just awesome. I cant stop looking at them! Thanks so much for sharing them with us. 3 an 4 look a lil flat. Wow! this looks really cool and awesome. I wish we had a great artist like him in our country. WOAH!! I love the last one. That one is awesome. are the kids real in the snowman one?? I can’t tell! !